For the remainder of this review Sir Alec Douglas-Home will be referred to as Baillie Vass. Well maybe not, but Private Eye did have fun with the PM who lasted less than a year. History does not look back too fondly on this period of the Tory parties time in power. The government was already damaged by Profumo and when they chose a hereditary peer as a Prime Minister in 1963 the country was not entirely convinced about this, and it seemed to represent the broken nature of the Tory government. Based on the bizarre true events of a near kidnap of Douglas-Home as he stayed in a house near Aberdeen (with no bodyguard) make for a fascinating little play. 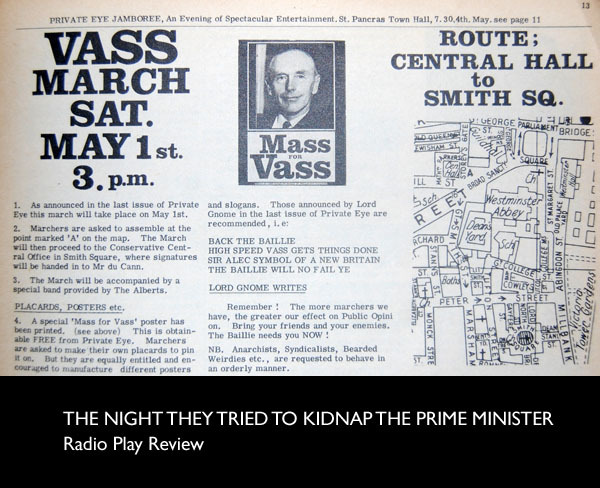 Whilst the situation is largely true, the dialogue and resolution are spun from the imagination of Martin Jameson, and it leads to a great 40 minute play. The cast is does a great job, and Tim Mcinnery is spot on as the doubt ridden PM. We will never know what conversation was had between the PM and the angry students that led them to abandoning their attempt (though the fact that Home believed it would lead to a Tory victory instead of Wilson was interesting). There is enough tension, and the suggestion of anger and violence to make this great drama. What it also does is highlight the current concern of the dislocation of politicians from the public, and some relevance to the position of Mr Brown… but not too obviously, it lets the dialogue make the points. For such a strange situation the dialogue seems very real, and whislt we can see times where issues and history are highlighted writer Martin Jameson wisely refrained from making the dialogue too ‘knowing’ which it is easy to do from 45 years distance. Well worth a listen, and another great bit of historical drama from the BBC. This was written by admin. Posted on Friday, August 7, 2009, at 2:55 pm. Filed under Drama Reviews. Tagged 60s. Bookmark the permalink. Follow comments here with the RSS feed. Post a comment or leave a trackback.